Chinese and culture are perhaps oft-forgotten aspects of our JC lives. After all, many have sworn off the subject indefinitely after the horrors of mugging for O Levels. However, these were the two aspects brought forth by Chinese Language Drama and Cultural Society on 13 May. 翠谷回响: 心霾 (Meaning: Heart and Haze) gave ticket holders a performance consisting of a calligraphy showcase, 8 songs, and 2 plays. Interspersed with humorous skits and strong emcee presence, none of these elements felt shoehorned in. The curtains opened to a full house, and the appreciative cheers and applause throughout the night were a resounding nod to the value and quality of the performance. For the authors, it was a reflection of how Chinese arts and culture are, too, captivating. Doors opened at 7.30pm, but many gravitated towards the calligraphy showcase at the front of house. Student ushers were present to provide information about the pieces: this author learnt that the most prominently displayed scroll was in fact not the handiwork of a CLDCS veteran, but by a new member of the club! However, that the exhibition was detached from the rest of the show meant that less attention was given to it. This was regrettable considering the rich history and painstaking process behind producing calligraphy. 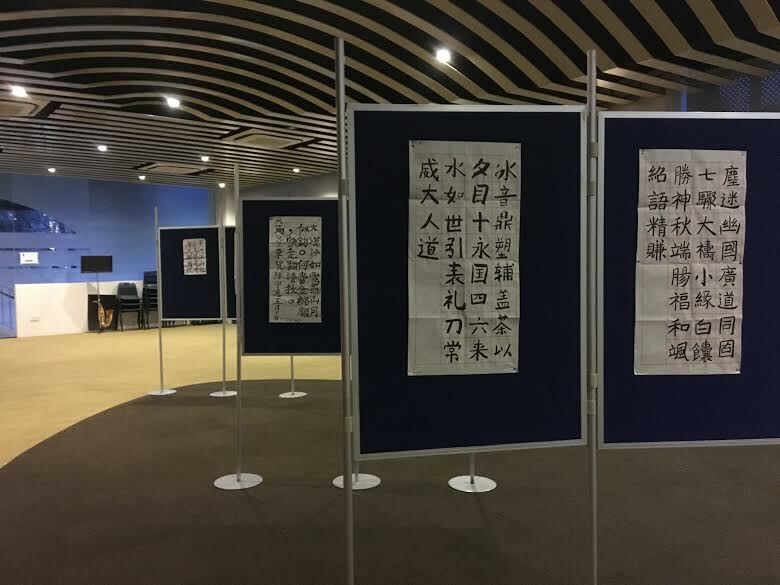 Calligraphy pieces displayed at the front of house. 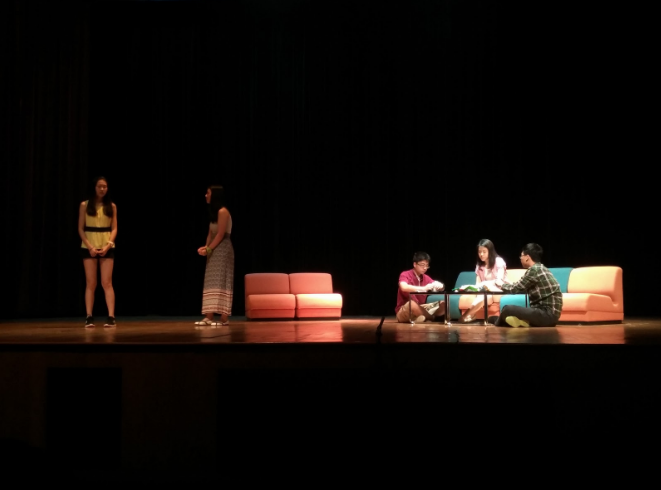 The first segment of the performance, 有风吹过 (Wind that Blows By), began with a familiar scene of friends chatting and teasing, before transitioning into a rather familiar slice-of-life performance depicting a school romance. The plot revolved around 小雪’s (Li Xueqing, 16S06G) blossoming romance with 李浩 (Wu Yidi, 16S06N) through romantic scenes consisting of walks in the rain and online chats. The show was infused with a gentle nostalgia and started as a present-day reflection on relationships and memories. The plot felt familiar, yet was not boring- achieved through the humorous banter between schoolmates and brief vignettes that encompassed the growth of individual characters beyond the realm of romance. What was especially commendable was the crew’s clever use of props: in conveying the growing attraction between its protagonists through online chat, the crew employed a sparse but effective set. It combined lighting and silhouettes to illustrate their online interaction, which may otherwise have been rather dry or abstract. These effects were managed particularly well thanks to the CLDCS members who could better coordinate musical cues and effects in the control room. The play ended exactly how you’d imagine it: a tearful reunion at an airport, a protagonist making amends with his mother, schoolmates reminiscing at a reunion much later- a classic happy ending to a delightfully simple play, completed with an implied kiss between the protagonists. It provided a sweet (but not saccharine) beginning to the night. Each subsequent performance took the overall to a higher level. Following the opening act, the CCA’s songwriting department took centre stage, regaling the audience with an interestingly diverse collection of 8 self-composed songs. Even to the untrained ear, the songs had the makings of hit songs like《那些年》or 《小幸运》- intermingling melodious notes with descriptions of nature and familiar themes of youth, love and loss. In these respects,《紧握希望》(Hold on to Hope)，《我们的夏季》(Our Summer)，《雨幕》(Rain Curtain) and 《风铃》(Windchime) successfully relayed the transient but poignant experiences of youth. The uncertainty of love, the pain of unreciprocated love, for instance, was conveyed through 《我们的结局》(Our Ending) by Hsiaofang (17S06G), Ruixi (17S06B) and Yoong Hui Xian (17S06M). Aptly, several of these songs were – for the first time – incorporated into the first play to complement its theme of youthful love and wistful reminiscence. An impressive rendition of a duet ballad, which displayed considerable skill. 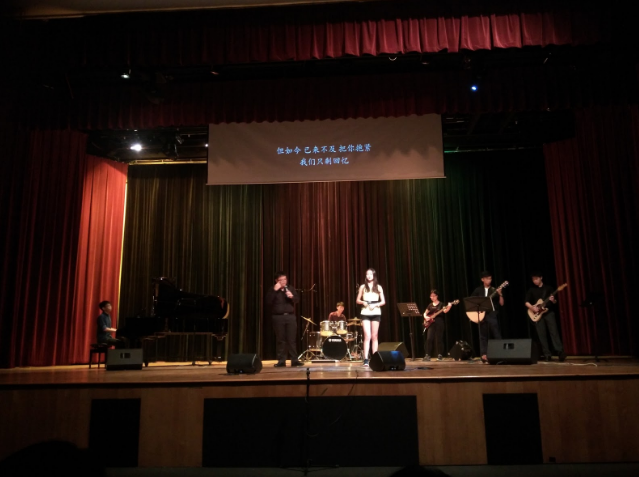 Apart from lyrical, catchy tunes, the CCA displayed remarkable range with its incorporation of diverse musical styles in a melange of jazz and pop rock in their songs, as in 《FLY》and 《惑》(Turmoil), by Zhu Deng (16S07D). The original melodies and lyrics were especially remarkable, given the lack of musical backgrounds for some performers. The instructor of CLDCS’s songwriting department, Mr Keith Kwok deemed it a “good learning experience” in which the students “worked very hard” in spite of time constraints to come up with original songs. Though not without hiccups in its delivery, the performers quickly recovered from missed lines or forgotten lyrics with strong, unwavering singing. On the whole, the songwriting department put up an immensely enjoyable performance. 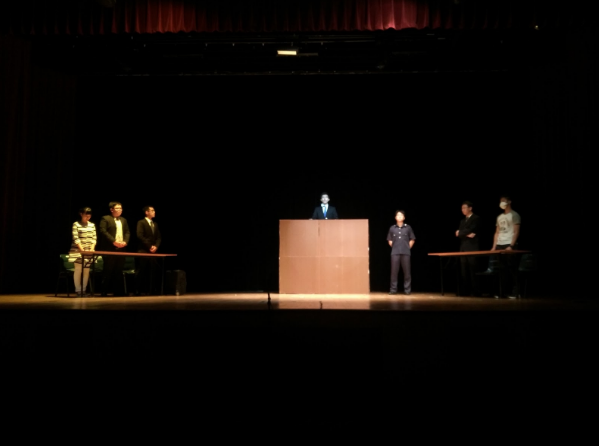 Following the conclusion of the skit, the curtains opened to a scene at a courtroom: spotlights frozen. A judge, a lone policeman, and lawyers at opposing ends, ready to strike. 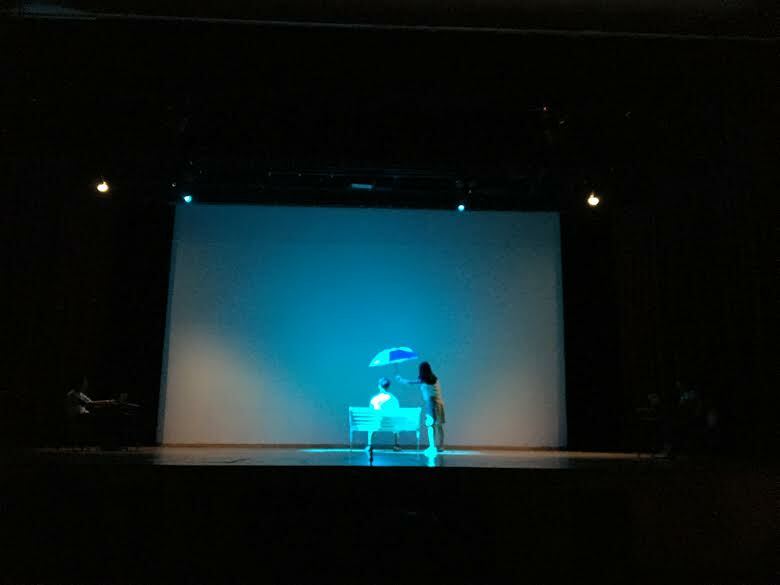 The opening scene dexterously set up the premise to 心霾, a play which focuses on the consequences of one’s actions. The play followed lawyer 姚乾明 (Wang Heng, 16S06E), who had defended an unscrupulous businessman 周能 (Zhu Deng, 16S07D) whose factories had been accused of releasing unacceptable levels of toxins. The opening scene of 心霾. Though profitable, his cover-up of client wrongdoing had massive repercussions on his relationship with his wife, leading to misunderstandings abound. Yet at the close of the play, where tension and pressure culminated in severed relationships, the protagonist realised the moral implications in his actions. It was a Kodak ending: wrongdoers are imprisoned and the protagonist reconciled with his wife, 付晓 (Zhu Ruixi, 17S06B). However, it also clearly conveyed the immutable consequences of our actions. 乾明 is still indicted for his involvement in the crime, and has to serve a three-year long sentence. Through perhaps anticipated, the play came alive through its characters, whose motivations, anger and misunderstandings were vastly The outstanding casting choices brought to life the different personalities and motivations of the characters, from the smitten but devious 周楚楚 (Zheng Tongxin, 17S06P) to the emotive and relatable 乾明. The audience’s applause was a ringing affirmation to the CCA’s hard work, and attested to the success of the show, especially given that many audience members appeared to personally know the performers. The cosy post-show atmosphere of congratulations was undercut by the fact that Mother Tongue language arts events were considerably less popular among the general student population, despite the high calibre of performance put up that night. Alvin Pang (17S06P), who was down to support just one performer, quipped, “I’ve never felt more like a minority,” as he nodded to the numerous pictures being taken close to the stage. It is probable that the appeal of arts in a Mother Tongue that we are less than familiar (or friendly) towards pales in comparison to the abundance of other arts events during this period. 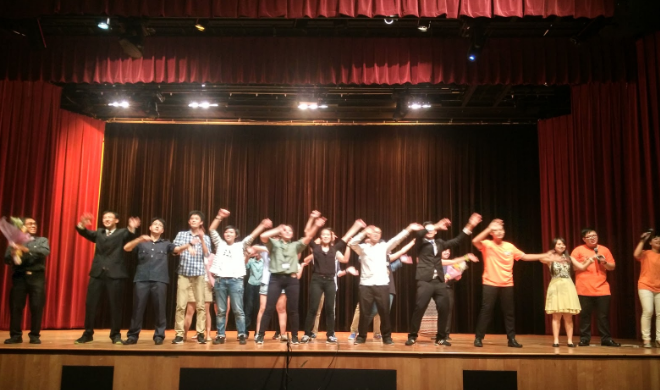 Yet CLDCS’s performance clearly reflects the friendlier, more accessible side of the numerous Chinese texts and essays that many a frustrated student has pored over — next year’s show, perhaps, will be another opening into the funner, richer aspects of Chinese arts and culture.